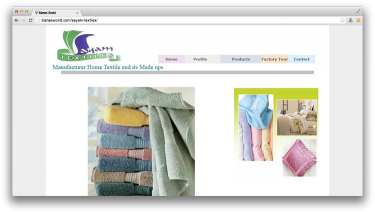 Description Sayam Textiles Cotton is Manufacturer & exporters of home textile products, bed sheets, bed covers, knitted fabrics, bed-linen, curtains, table-linen, bedsets, sofa covers, woven fabrics, knitted fabrics, duvet covers, pillow, textile printing of fabrics, dyeing and finishing, in Pakistan. Address F-169/A-1, S.I.T.E. Area Karachi.